Who are these aimed at? Our Advanced Courses are for people who are confident kayaking in force 4 conditions and are able to paddle 25km+ in a day. Rock-hopping with a swell, surfing, and playing in tidal streams are all things you enjoy. You are able to use rescue techniques in real situations. You can plan day trips confidently and are able to navigate along a coastline even in poor conditions. Short open crossings are something you are happy with in good conditions. If this sounds like it is too advanced for you then take a look at our Intermediate Courses, or if your not sure then get in touch and we will help to fit you into the correct group. The courses listed below are some of the most popular Advanced Courses we run. 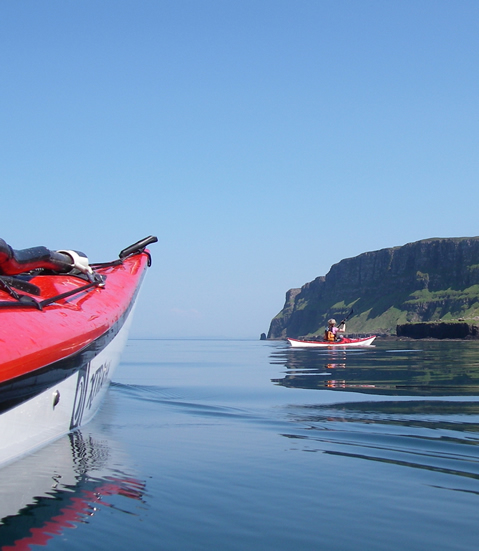 You are now an experienced paddler and you know what you need to work on for your own sea kayaking so let us know what you want to develop and we will set up a course to meet your specific needs. With our Advanced Courses we always keep group numbers to a minimum to ensure the safety of our clients in an advanced water environment. We are also then able to better progress the learning development of our clients. Top of the range sea kayaks are available to ensure you have the best equipment possible, and we also run courses in paddling fast Sea-kayaks with Rudders, see below! All specialist equipment can be provided, or you can bring your own. Our fleet of Fast Ruddered Sea-kayaks mean we can cover long distances, with minimum effort – surely the goal we should all be seeking! With a variety of models and designs, we ensure everyone in the small group has a fast sea-kayak to suit, and we make the most of the day to access some remoter parts of our coastline . . .
We look at how and why we do what we do in rescue situations. It is all about doing things which are practical and realistic in a dynamic changing environment. This is a physically demanding course, for which you will need your own drysuit, and come prepared to get wet!! We search out some interesting tidal races on the west coast of Scotland! This course is aimed at improving your confidence and understanding of moving water; breaking in and out, ferry gliding, surfing. The power of the tide can help you manoeuvre your boat if you can learn how to manipulate it. Plan, implement and navigate open crossings with confidence. In this course we look at the tidal planning involved in open crossings and the navigation techniques needed to paddle in open water. We often use the Small Isles which are just across the water from our base at Glenuig Inn. Alternatively if you want to paddle to a specific place then get in touch! For more details on planned Advanced Courses, check our dates page. We are always very flexible so if there is nothing which suits you planned already then let us know and we can plan a course around you.